Denis Dennison, 75 died at the home of Howard Sherman, two miles from his Laurel farm, on Wednesday, February 6th, at 2:00 p.m., death being due to heart failure, following a stroke. Funeral services were held from the Swedish Mission Church at Wakefield, Sunday afternoon, Rev. John G. Nelson conducting the services. He was laid to rest in Wakefield cemetery beside his wife, who proceeded him six years ago. afterwards they moved to Wakefield, Nebraska, in the vicinity of which place they spent practically all the balance of their lives, it being on the Wakefield farm that seven of the surviving children were born, he thus leaving four sons and four daughters- Albin and Reuben, at present in Omaha; David, of Waterbury, and Lawrence, the youngest, who has been living with his father in Cedar, County; Mrs. Edna Fairfield, of Chicago; Mrs. Esther Barto, and Mrs. Anna Stevens, of Omaha; and Mrs. Olga Swanson, of Laurel. Besides being a old settler in these parts, coming here in 1884, he was also known in the capacity of thresherman, having worked in that line for years, and having the honor of driving out the first steam rig to be taken out of Wakefield. For years, in fact until his death, he conducted threshing rigs and Sheller's in this part of the country. A couple of years ago he, with a son, was engaged in truck driving here. He will be missed my many of the older settlers, and with his passing goes one of the real pioneers of Dixon County. Died, at his home near Ponca, on January 30th, 1894, Judge Edward Arnold, in the 72nd year of his age. Judge Arnold was one of the best known and most esteemed citizens of the country. He was born May 1, 1822, at Cork, Ireland [Rathcormac, County Cork, Ireland]. When quite young he came to this country, locating in Holyoke, Massachusetts. He was married at Woonsocket, Rhode Island, on May 11, 1844, to Mary O'Hara, who now survives him. In 1857 he and his family came west, arriving at Sioux City, Iowa, on the steamboat, Essy Wilgus [Asa Wilgus], May 8, 1857. From Sioux City, which was then a town of tents and log cabins and perhaps a hundred people, he came to Dixon County and has resided her ever since. Hence, as will be seen, he was one of the earliest settlers of this county. When he came, the white inhabitants were few and scattering and the land was mostly unbroken and uncultivated. Where are now dense settlements and cultivated farms was then the home of the Indians and buffaloes. Where we now see large town, extensive business enterprises, elegant residences, railroads, telegraphs and a multitude of other evidences of progressive and educated people, then the country was yet wild, and a white man was almost as much of a rarity as the Indian is now. etc, etc. Last Friday evening at eleven o'clock occurred the death of Daniel McDonald, a pioneer of Dixon County and Northeast Nebraska. Mr.McDonald came to Dixon County in 1873 and located on a farm three miles west of Martinsburg and has lived in the county since. He was born in Ireland over eighty-five years ago, but went to Scotland when a boy. In early manhood, he came to the United States, landing at New Orleans, where he lived a few years and in the early fifties he located in Galena, Illinois. In 1858 he was united in marriage to Miss Ellen McMahon of which union four children were born and survive him. B. J. McDonald of Emerson, J. E. McDonald of San Antonio, Texas, Mrs. Dan Donlin and Mrs. Chas. Eyler of Ponca. He is also survived by his life mate, who is in good health at the age of eighty-two. The funeral services were conducted from the Catholic Church in Ponca, Tuesday morning and the remains laid to rest in the South Creek cemetery near Ponca. The Ponca Journal Leader says in part: The funeral services were held in St. Joseph's church in Ponca this (Tuesday) morning, Oct.6, Rev. Father O'Toole of Newcastle celebrated the requiem high mass. The church was crowded with relatives and friends of the deceased , who had assembled to pay their last respects the the departed pioneer and citizen. Father O'Toole delivered a beautiful funeral sermon, touching upon the high noble life of the departed one, and held out assurance to all that the deceased had lived a life in accordance with the doctrine of the church; that he had passed over to the other shore where sorrows are unknown and where he will receive the reward promised to those who serve His commandments. We shall miss his cheerful smile as we were accustomed to seing him in everday life. His hearty handshake was the evidence of his true friendship. (the rest of the obituary is unreadable). This Obit appeared in the Journal, Ponca, Ne on Thursday, April 8, 1909. Christina Jane Dennis was born in Allegheny county, New York, January 16, 1829, and died at her home on Silver creek, Dixon county, Nebraska, March 29, 1909. She was married to Anthony Dennis July 4, 1850. We quote as follows from The Journal files of September 22, 1892, concerning the death of her husband. "Died at his home in this city on Friday, September 16, 1892, of heart disease. A. Dennis aged 76 years and 20 days. Deceased was a early settler of Dixon county, having located on a homestead in Silver creek in 1870, since which time he has been one of our honest and much respected citizens. He has been a constant sufferer for the past year and has borne it all with the greatest patience. The funeral was held in the M.E. church Sunday afternoon, Rev. Mr. McCool conducting the services." To this union were born eight boys and three girls, of which all but two grew to manhood and womanhood. William H., of Hastings, Neb., Horace G., who died some 18 years ago, Geo. A., of Waverly, Ia., Chas, S. of Sioux City, Ia., John W., of Vona Colo., Jacob D., of Dixon county, Mrs. Mary Miller, of Elk Point, S.D., Mrs. Delilah Cassavant and Mrs. Josephine Cassavant, both of Sioux City, Ia. Mrs. Dennis, with her husband, moved to Nebraska in 1870 and has continued to reside in Dixon county since. She leaves two sisters, Mrs. M. Burgett, of Sioux City, and Mrs. Orin Huff, of Limestone, N.Y.
She associated herself with the M.E. church in early childhood and has since been a steadfast member. The funeral services were conducted Wednesday of last week by Rev. J.J. Kemper at Central church,. Burial took place in Ponca cemetery. Funeral services were held in St. Peter's Church here Monday at 9:00 a.m. for Mrs. Mary Mannion, 86, who died at her home in Newcastle, early Saturday morning after a 2 weeks illness. Rev. William Giblin officiated at the Requiem high Mass performing the final rites before a host of friends and relatives gathered to pay their last respects to the deceased. Arrangements were in charge of O'Toole - Gunn and interment was in Calvary Cemetery. Mary Burgess Mannion was known in the community as "Grandma Mannion". She was born in Canada on May 14, 1854 and died June 15, 1940 in her home at Newcastle, Nebraska at the age of 86 years, one month and one day. She was a faithful member of St. Peter's Parish and Sacred Heart Sodality. She came to Dixon County as a girl and lived on the Daily until she married , then moving to a farm two and a half miles south of Newcastle. She married William Mannion on April 15, 1873 at Jackson, Nebraska, living in the community for 75 years. She leaves to mourn her death: two daughters, Mrs. Elizabeth Dougherty of Newcastle and Mrs. Mary Rice of Oklahoma City, Oklahoma; and five sons: Joe, Michael and Charles of Newcastle, Will of Laurel and Leo of Marshall, Minnesota. She was preceded in death by four sons: George, Jack, Patrick and Lawrence and one daughter who died in infancy. Her husband also passed away several years ago. She is also survived by 38 grandchildren, 30 great-grandchildren and 4 great-great-grandchildren. Her pall bearers were her six grandsons: James, Louis and Mike Mannion and Frank, John and Raymond Dougherty. Published in the "Missouri Valley Times" (Missouri Valley, Iowa) on September 14, 1916. Robert N. Smith passed away this morning at the home of his brother, W.A. Smith, at California Junction. Mr. Smith was born near Boston, Lincolnshire, England, Jan. 1830, and came to America Feb. 1858.The first stop was made in Wisconsin and afer a brief stay in that state he came to Harrison County and settled near Calhoun the same year. In 1860 he took a trip overland to Denver and in 1861 took another down the Mississippi to New Orleans with a barge of merchandise. On his second trip he was taken into the Confederate Army with a company called the Louisiana Tigers, where he served until 1865, when he surrendered to the Union Army. He returned to his home in Cincinnati township [located in Harrison County, Iowa] in April 1865, and lived here until 1875, when he moved to Kansas, residing there until 1882. Later the family moved to Nebraska and in 1897 his wife passed away. She formerly was Mrs. Jane Madison of Virginia, who he married while serving in the army. No children were born to this union. He leaves one sister, Mrs. Granger, and two brothers, W.A. and Jacob, to mourn his death. The funeral will be held Tuesday afternoon at 2 o'clock from the church of California Junction, and interment will be in Concord, Neb., Wednesday. Note: The above obituary states that Mrs. Jane Madison Smith passed away in 1897 in Nebraska, her tombstone enscription gives the year 1896. 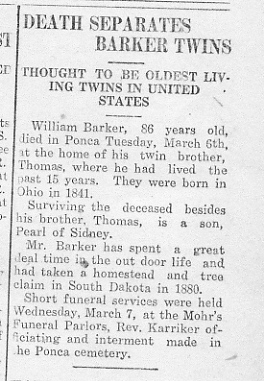 Here are two obituaries, pertinent to the Barker Twins (one of whom was my great-great grandfather William P. Barker). 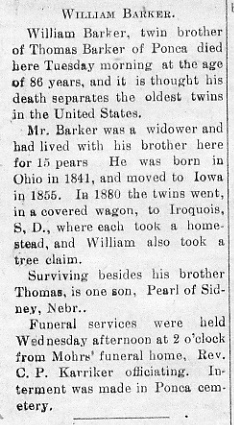 Obit 1 is from Nebraska Journal -Leader Ponca Nebraska newspaper, March 8, 1928. Ponca had two newspapers for a little while, 1928 was one of the years. Obit 2 is from Dixon County Advocate, March 8, 1928.